New products that help us be in two places at once — virtually, anyway — continue to appear in the form of telepresence robots. Using a number of different hardware combinations, software and sensors, individuals in one physical location can have a presence in another location with these robots. Think video conferencing on a screen that can move around by a remote control, similar to the Curiosity robot current visiting Mars that cost $2.5 billion to design, build and launch. What’s more: Thanks to newer robots that take advantage of current consumer electronics, there’s one for every budget. For starters, the $9,700 QB robot from Anybots is much cheaper than Curiosity, but it’s still beyond the reach of mainstream consumers. It’s really meant for enterprise solutions to be used as a virtual greeter or even for students to “attend” school when they’re not well enough to be there in person. 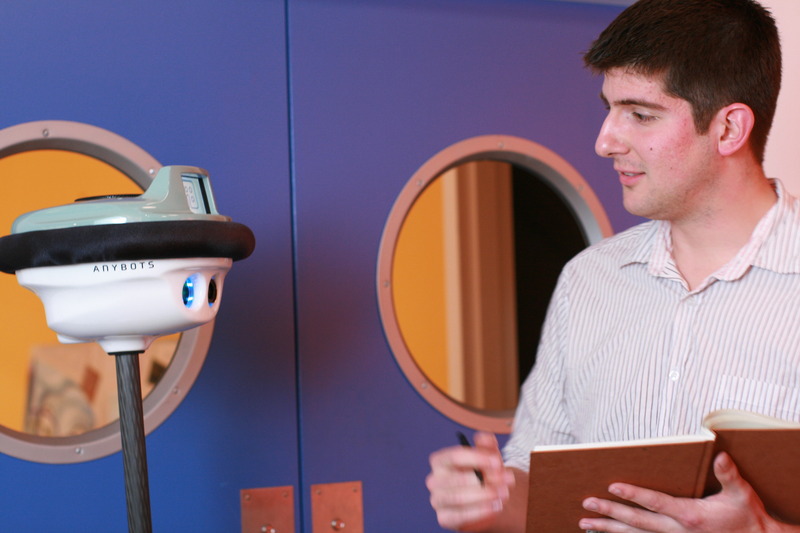 The QB robot is similar to a self-balancing Segway device, but adds a small display, camera sensors and a microphone. Nearly ten grand is still too much money for most people. What does just 20 percent of that price get you? If you have an iPad — and $1,995 — it gets you a similar product from Double Robotics, says PhysOrg. Last week, the company announced pre-orders for its “Double” robot, which uses a similar self-balancing mechanism to that of the more expensive QB robot, but you add the sensors. How? Double has a mounting bracket for an iPad, which provides connectivity, a camera, speaker and microphone: Everything you need to “be” somewhere else. Double isn’t just a name for the robot though, since you’ll need not one, but two iPads for it. One is used on the robot itself, while the other is used to control the Double and see or hear what it’s experiencing. That hasn’t put off interested buyers, however: The first production run of Double robots is already sold out and new pre-orders won’t ship until next year. But maybe even $2,000 and two iPads is too pricey. No worries, because there’s a Kickstarter project that’s nearly funded and all it will cost is $299 to get a telepresence robot. The Botiful uses nearly any Android phone for the robot’s eyes and ears, while a small three-wheeled base moves Botiful around. Since the project isn’t yet funded — it has $85,571 of its $90,000 funding goal, with 45 hours remaining — you can still get in on the project with pledge of $245. For roughly the cost of a Google Nexus 7 tablet, you can use Botiful and your Android smartphone with Skype(s msft) to magically be somewhere else. While the prices and feature-sets of all these examples vary greatly, one aspect remains constant. The advances in smartphones and tablets — namely mobile broadband connectivity, multiple sensors and VoIP software — are enabling a new product line just as I envisioned in 2010 when I suggested then that today’s smartphones would power tomorrow’s robots (subscription required). With mobile devices working as the eyes, ears, and mouth of a robot, all that’s left is adding mobility to give movement. We’re doing that today on Mars for a few billion dollars and you can do the same today in your home or office for a fraction of that investment. Of course, if you’ve got money to spare, you could do what Google(s goog) co-founder, Sergey Brin, did when speaking on stage at an X-Prize fundraiser he couldn’t physically attend. 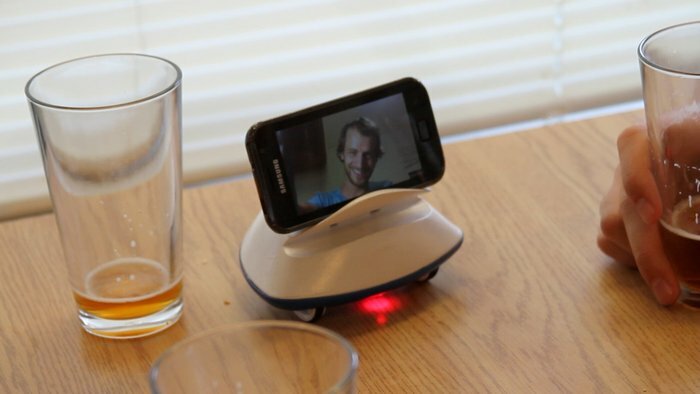 Instead, he used a prototype Texai telepresence robot built by Willow Garage to speak to the audience in “the room next door,” he joked from Utah. Really intrigued by Botiful, a lot of capability for such a simple and inexpensive solution. Hope they are funded to help drive the nascent industry.